First, clean and peel potatoes. 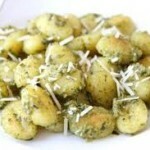 Cut potatoes into 30cm cubes; be sure to cut into cubes consistent in size so that they cook evenly. Place cut potatoes in a medium-sized pot; fill with water just to cover. Add salt and cover with a lid. Stirring occasionally, boil potatoes for about 20 minutes or until fork tender. Over-boiling will cause potatoes to become mushy and too wet. Remove potatoes from water; drain well. Allow them to cool enough to handle in a colander or over cheesecloth. Peel potatoes by hand, rice potatoes using a potato ricer and keep in a towel to remove excess water. 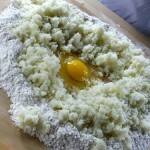 Add semolina and flour to potatoes then use your hands to knead briefly until a soft dough forms. 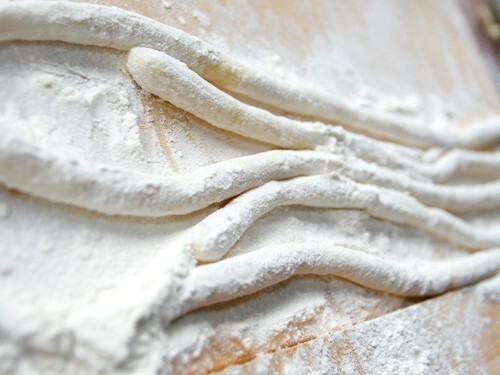 If mixture is still sticky, add a little more flour (the amount of flour added is crucial – too much flour will make the cooked gnocchi heavy and tough, while too little flour will cause gnocchi to disintegrate during cooking). 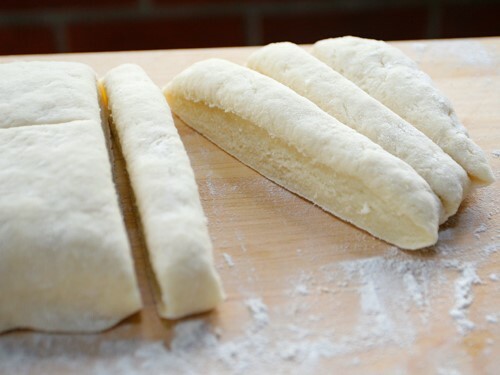 Knead until ingredients are thoroughly combined and turn dough on to a lightly floured surface. Form a wide rectangle with dough. 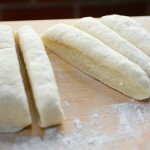 Cut dough into about 8-10 pieces; roll each piece by gently pushing with fingers spread. 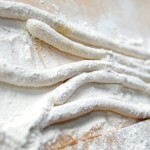 The goal is to make an evenly-distributed rope and cut gnocchi into short pieces of 20 to 30cm in length. You may use a fork to make ribs, or indent gently with your thumb. 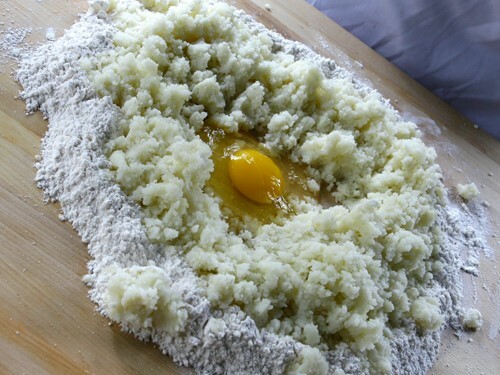 This process isn’t necessary and works best when creating plumper gnocchi. Bring a large saucepan of water to the boil. Add 1/4 of the gnocchi. As they cook, gnocchi will rise to the surface of the water. 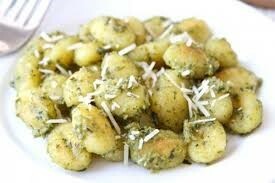 Continue cooking gnocchi at the surface for about 10 seconds then remove with a large slotted spoon and drain well. Repeat with remaining gnocchi. Toss them in a saucepan with your favourite sauce and cook together for about 2 minutes.